Editorial: Out with the old and in with the new! Orthodontic tooth movement is accompanied by tissue remodelling, which can be observed through bone apposition on the side under tension and bone resorption on the side under pressure. Without attachment, it is not possible to obtain this type of tissue transformation. Orthodontic tooth movement towards an infraosseous lesion does not allow attachment gain and increases the degree of bone damage around proximal teeth. In this situation, it is recommended to treat the lesion with a surgical periodontal regeneration technique before beginning the orthodontic displacement. According to the principle of guided tissue remodelling, a membrane placement leads to the formation of a newly regenerated tissue on the surface of the tooth under pressure. This tissue presents all the potential necessary for the formation of a new connective tissue attachment and leads to bone repair at the end of orthodontic displacement. Today, with the use of enamel matrix derivative, proteins can provide the same results as those obtained with membranes in the treatment of infraosseous defects. Therefore it is possible to use Emdogain® in a pre-orthodontic situation according to the principle of guided tissue remodelling. Because of the shared root and anatomically predetermined connection paths between the periodontium and the endodontium, a bacterial infection originating in one of these tissues may transfer to the other. The long-term prognosis after treatment of perio-endo lesions is determined by correct primary diagnosis and careful endodontic treatment, followed by periodontal treatment if necessary. According to current knowledge, some oral autoimmune diseases, such as oral lichen planus, should be assessed as precancerous conditions with a minor tendency for malignancy. Restitutio ad integrum from these diseases is not possible. Prognosis for degeneration is unpredictable, given the initial clinical and histological symptoms. It is important but difficult to motivate the patients to come in for follow-up exams at least once a year and to commit to more efficient oral hygiene. Local antibiotics have been reported successful in the treatment of destructive periodontitis. However, design, stringency and outcome of such studies seem variable. Thus our focused question was: are scaling and root planing (SRP) with adjunctive topical antibiotics superior to SRP alone in treating chronic periodontitis? 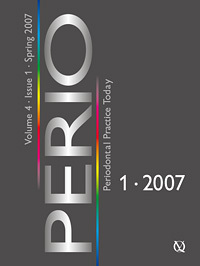 Reports from 1990 and 15 years on were electronically searched in central databases using the terms 'periodontitis'/'periodontology' combined with 'local antibiotics'/'topical antibiotics'. Only randomised, blinded, controlled clinical trials (RCTs), comprising more than 20 patients diagnosed with chronic periodontitis, adjunctively treated with a single, topical antibiotic, and with a follow-up of more than 3 months were accepted. Treatment outcome was assessed by changes in clinical attachment level from baseline to end of study. The initial searches produced 198 articles, which eventually were reduced to 11 according to the inclusion criteria. The analyses of this group of articles gave no clear-cut answer to the focused question, but displayed a possible benefit of applying topical antibiotics in conjunction with SRP. However, the benefit was small and of doubtful clinical significance. Rudralingam, Meenakshi / McCracken, Giles I. / Nolan, Anita / Heasman, Peter A. Methods: Histological staining with haematoxylin and eosin of a gingival biopsy of the intra-oral lesion revealed diffuse sheets of malignant cells, which were confirmed as being lymphoid cells of B cell lineage Newcastle University using immunostain with CD20 marker. The Ki67 proliferation fraction was about 50%, which supported a diagnosis of a high-grade lymphoma, and the overall features confirmed a diagnosis of a diffuse, large B-cell lymphoma. Results: Periodontal treatment was largely ineffective but the introduction of a CHOP-R chemotherapy regime resulted in dramatic and instantaneous resolution of the oral ulceration and associated symptoms. Conclusions: The report demonstrates that the clinical signs of gingival ulceration and necrosis can, albeit rarely, represent a manifestation of an underlying, insidious general pathology which in this instance, transformed into a diffuse, large B-cell lymphoma. Reismann, Peter / Lichy, Christoph / Rudofsky, Gottfried / Nawroth, Peter P. / Staehle, Hans-Jörg / Bierhaus, Angelika / Dörfer, Christof E.
Objective: Polymorphisms of the toll-like receptor 4 (TLR4) have been reported to confer differences in the inflammatory response to gram-negative infections. Since periodontal diseases are caused by gram-negative microorganisms, we performed a pilot study to investigate the association of two polymorphisms (Asp299Gly and Thr399Ile) of the TLR4 gene with the risk of chronic periodontitis. Study design: In a monocentric cross-sectional study, 75 caucasians with chronic periodontitis and 54 periodontally healthy controls were investigated. Asp299Gly and Thr399Ile genotypes were detected by polymerase chain reaction (PCR) and subsequent cleavage by NcoI and HinfI restriction endonucleases. Results: In total, 9.3% (12/129) of the individuals, 13.3% (10/75) of the periodontitis group, and 3.7% (2/54) of the periodontally healthy controls were heterozygous for both polymorphisms. However, an increased prevalence of the Asp299Gly and Thr399Ile genotypes in the periodontitis group was shown, but it failed to reach the level of statistical significance either in the univariate method (p = 0.073) and also in the multivariate logistic regression model [odds ratio (OR): 4.000; 95%-confidence interval (95%CI) 0.839-19.061; p = 0.063]. Conclusions: Our results suggest that the presence of Asp299Gly and Thr399Ile polymorphisms of the TLR4 gene might have implications for the risk for chronic periodontitis, but larger studies are needed to confirm these data. Objective: The aim of the present study was to evaluate the reproducibility of a commercial kit for the detection and semi-quantification of five periodontopathogenic species. Background: A commercial multiplex PCR-based method has recently been validated for the detection of Actinobacillus actinomycetemcomitans, Porphyromonas gingivalis, Tannerella forsythia, Treponema denticola and Prevotella intermedia. Study design: Sixty-five untreated sites with different probing pocket depths in 20 chronic periodontitis patients were sampled twice by simultaneously applying two sterile paper points. All samples were coded and separately analysed for the detection and semi-quantification of five periodontopathogenic species. Results: The present study indicated acceptable reproducibility of the commercial test for Treponema denticola, Tannerella forsythia and Porphyromonas gingivalis: agreement varied between 70% and 79% in species-positive sites. In contrast, low agreement was found for Actinobacillus actinomycetemcomitans (47%) and Prevotella intermedia (57%). Data analysis indicated, however, that low agreement for these species might have been a consequence of the border line of the detection limit. Conclusion: The results of this reproducibility study support the use of this multiplex PCR-based method for the detection and semi-quantification of periodontopathogens in subgingival plaque samples. Barros, Raquel R. M. / Novaes jr., Arthur B. / Palioto, Daniela B. / Souza, Sérgio L. S. / Taba jr., Mário / Grisi, Márcio F. M.
Background: Long-term evaluation of gingival recession treatment is important for clinical decisionmaking. The aim of this clinical trial was to evaluate the acellular dermal matrix graft (ADMG) in the treatment of gingival recessions over a 3-year follow-up period, comparing a new surgical approach (test group) to a conventional procedure (control group). Study design: A total of 28 bilateral Miller Class I or II gingival recessions were selected and randomly assigned to test and control groups. Gingival recession, width of keratinised tissue, probing depth and relative clinical attachment level were assessed at baseline, 12 months and 36 months post-surgery. Results: Although both procedures improved all the evaluated parameters for all periods, comparisons between the groups revealed statistically significant greater recession reduction favouring the new technique from baseline to the 12-month evaluation and from baseline to the 36-month evaluation (p = 0.000). Statistically significant differences were not found between the 12-month and the 36- month evaluations; however, the root coverage obtained with the conventional technique decreased from 60% at 1 year to 58% at 3 years, while for the new technique it remained stable at approximately 83% over 3 years. Conclusion: The new technique is more suitable for root coverage with ADMG when compared with the conventional procedure, showing a statistically significant better clinical performance that was maintained over a 3-year period. Jankovic, Sasha M. / Zoran, Aleksic M. / Vojislav, Lekovic M. / Bozidar, Dimitrijevic S. / Kenney, Barry E.
Background: The biologic mediators from platelet-rich plasma (PRP) modulate cell proliferation and differentiation in a cell type-specific manner, leading to enhanced tissue reparation and regeneration. It is conceivable that concentrated growth factors within PRP up-regulates cellular activity and subsequently promotes periodontal regeneration in vivo. This study was designed to evaluate and compare clinical effectiveness of activated PRP in the standard treatment of gingival recessions with connective tissue graft (CTG). Methods: Basic surgical technique was based on the use of CTG and coronally advanced flap procedure. Fifteen gingival recessions Miller class I or II were treated with CTG and PRP (group CTG+PRP). After elevation of the flap, bone and root surfaces were smeared with activated PRP gel. The CTG was also irrigated with PRP gel before placement over the exposed root surface. After suturing, the CTG was covered with a coronally advanced flap. In the same patients, 15 other gingival recessions were treated with CTG in combination with a coronally advanced flap (group CTG). Clinical recordings were made of vertical recession depth (VRD), probing depth (PD), clinical attachment level (CAL) and keratinised tissue width (KTW) before and 6 months after mucogingival surgical treatment. Clinical evaluation of healing events was estimated with recordings of the healing index (HI). Recordings of HI were performed on the 1st, 2nd and 3rd week post-surgery. Results: Mean values of VRD were significantly decreased from 3.61 ± 0.70 mm to 0.30 ± 0.45 mm (p < 0.01) in the group CTG+PRP (91.68%) and from 3.45 ± 0.84 mm to 0.38 ± 0.48 mm (p < 0.01) in the group CTG (mean root coverage 88.96 %). The difference between the two tested groups was not statistically significant. Results of the KTW showed significant increase from 1.32 ± 0.66 mm presurgery to 3.20 ± 0.54 mm (p < 0.01) 6 months after in group CTG+PRP, and from 1.41 ± 0.58 mm to 2.55 ± 0.45 mm in group CTG (p < 0.01). Results of KTW showed statistical significance of recorded differences obtained in the two evaluated groups (p < 0.05). There was no statistical significance in reduction of PD and CAL recorded in CTG+PRP and CTG group. The values of HI recorded on the 1st and 2nd week post-operatively were significantly enhanced in the CTG+PRP group (3.11 ± 0.32 and 4.20 ± 0.27) in reference with HI values recorded in control group (2.25 ± 0.54 and 3.05 ± 0.38). Conclusions: The results of this study confirm both procedures as effective and highly predictable surgical techniques in solving gingival recession problems. The addition of PRP resulted in an increased width of keratinised tissue and advanced tissue healing.